Does anybody have a good place to order custom ice trays for large-format ice? 2in by 2in cubed or 1in by 1in by 4in? Things like that. Container Store sells compartmental boxes. It works well for making big ice, although it's clearly not designed for such a purpose and hence can be somewhat frustrating removing the ice from hard plastic. I got mine through Amazon. went around here as well, and if you haven't watched the videos, perhaps you haven't lived? I'm just saying. These are great. Does anybody know where to get trays made to specific sizes? I'm looking to fit them to the glass as close as possible. What size are you looking for, perhaps I could help. 2 1/2 by 2 1/2 cube or 3 by 3 cube for shaking and rocks glasses. 1 1/2 by 1 1/2 by 6 for collins glasses. here's what I am thinking, surgical stainless steel square tubing. Cut to length, corked, stood up in you freezer and run under a little warm water to unmold. They aren't cheap and this wouldn't be so good for massive quantities of ice but a little work with a hack saw and a file, and you've got the perfect ice. 9545k22 is a stopper, again a little work to make it square, but I think it could handle being pulled apart while frozen. they don't seem to make one big enough for the three inch ones. but there is something out there. If you're not too handy with tools never underestimate the power of undergraduate art students. They have access to great tools and their prices are negotiable. for rocks at home i have a 2" cube silicon bakeware thing that makes 4 cubes at a time and I love it. could make 16 a day if I was focused, which would be enough for where I work. Just an idea. 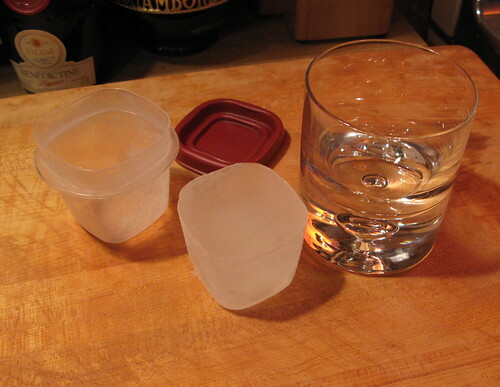 There's a thread like this over at the Chanticleer Society, and down at the bottom of Page 2 the suggestion was made to get the Rubbermaid 1/2 cup storage cups, which make perfect 1-cube-per-rocks-glass ice. I got some at my local Ace hardware, and sure enough, they're perfect, and the "cubes" release easily. These are authentic 2" round ice moulds from Japan. They are perfect recreations of the type of ice moulds being used by Prof. Jerry Thomas and others in the prefect pre-prohibition cocktail. I received my order yesterday, and I'm using them tonight in Ward 8's. Whisky Sours and the Classic Whisky Cocktail (all from Dave Wondrich's Imbibe). They are perfect recreations of the type of ice moulds being used by Prof. Jerry Thomas and others in the prefect pre-prohibition cocktail. What's your basis for this? I've always been given to believe that the primary source of ice in the pre-prohibition period was a large block of ice that was carved or chipped to order. Certainly this would have been the case before mechanical refrigeration became widespread, no? Is that really a $41 ice cube tray?! Man, that big cube looks cool as all get-out. But I'd be worried that it would slam into my front teeth. Straw please! I've heard there is a Hoshizaki ice machine that puts out 2 in cube ice, but it's only avalible in Japan. Does anyone know how to get something like that into the country? Can it be brought in through customs? Will it violate rules concerning bar permiting? (I'm in Los Angeles) How much does it cost? I don't know how to translate any of the information on their website. Hey John, go to the Google Homepage and click Language Tools. They give you a place to enter the URL for the page you want to translate from Japanese (or any of a long list of languages). It recreates the page but with the text in your language, and often some very entertaining mistranslations. Still, you usually understand enough to get the info you need. I just tried on your linked page and it works fine. Good point Andy, I should have further elaborated on my post. This large round ball ice would have been carved from block ice back in the day. The Japanese seem to be the only ones that have preserved this tradition of using large ball ice in cocktails, and have developed these moulds accordingly. Wondrich writes of this in Imbibe, and I'm too busy drinking my Sazerac (alright, lazy ) to get up and search for the page number right now. These are authentic 2" round ice moulds from Japan. If you happen to live near a Daiso store, they carry a wide selection of ice ball molds (and ice molds in general), generally in the range of $1.50 USD. Look in the container section- they're sort of hidden in plain sight.